← Rain and more rain. And 9 miles. I really love to bake and I have a bunch of recipes I’ve printed out I want to try, from baked donuts (yum! no donuts in Italy so I haven’t had any donuts in … I can’t remember!) to pumpkin muffins to a !one bowl” chocolate cake from Eating Well magazine. For nonna’s 90th birthday a few weeks ago, I wanted to make something that would be pretty. She hasn’t been doing well for the last couple of months and I hoped that a homemade treat would cheer her up. She has always had a healthy appetite and really resents not being able to eat what she likes recently. So I thought some sugar cookies might be nice to try out with the cookie cutters I bought months and months ago but hadn’t even used once yet. I like sugar cookies but my mind usually rebels at the amount of butter in the recipes! What the heck, I thought, it is for a special occasion. So off I went to look for a recipe on the internet and this one from What’s For Lunch Honey? really sounded simple as well as delicious with the bit of spice added in. Meeta’s cookies are a beauty with the pistacchios and lavender on top but I got another idea I wanted to try out. 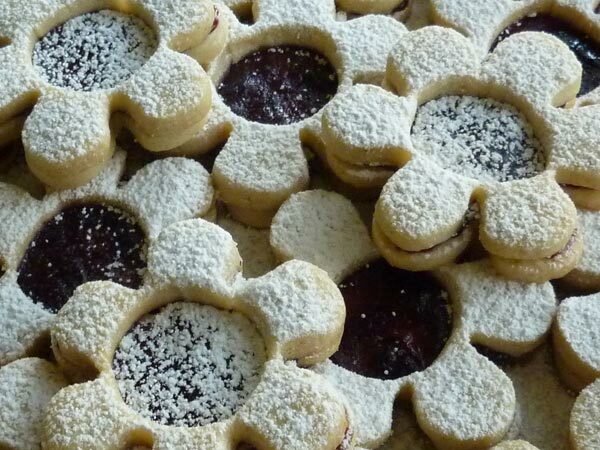 Here in Italy, “occhio di bue” cookies are really popular where you basically have a round cookie, jam on top and another round cookie with the center cut out set on top which forms the “ox eye” as they’re called in Italian. I wanted to try making my version of these cookies. Here is my adaptation for the spices I had on hand and the cutters I decided to use. Cream the butter, sugar and spices together. Beat until creamy in texture. Meeta’s tip: Don’t overmix otherwise you’ll incorporate too much air and the cookies will spread during baking, losing their shape. Beat in the egg until well combined, add the sifted flour (I think I forgot this step) and mix until a non sticky dough forms. Knead into a ball and divide into 2 or 3 pieces. Roll out each portion between parchment paper to a thickness of about 5mm/1/5 inch (0.2 inch). Refrigerate for a minimum of 30 mins. Meeta’s suggestion to roll the dough out between the parchment paper and then refrigerate really cuts the time needed to chill the dough and make it is easier to work with. Once chilled, peel off the parchment paper and place the dough on a lightly floured surface. Cut out shapes with cookie cutters or a sharp knife. Arrange shapes on parchment lined baking sheets and refrigerate for another 30mins to an hour. It’s very important you chill them again otherwise they’ll spread while baking. Preheat oven to 180°C / 350°F. Bake until golden around the edges, about 8-15 mins depending on the size of the cookies. Since I had some cookies without a center, you should bake the same sized cookies together to make sure they are all done at the same time. In a small bowl, mix 1/2 cup of jam with a little bit of water, about 1 tbsp. Heat in the microwave for about 30 seconds, watch it since you want it to warm up but not boil. Mix as soon as you take it out, the mix should be more spreadable but not too watery. 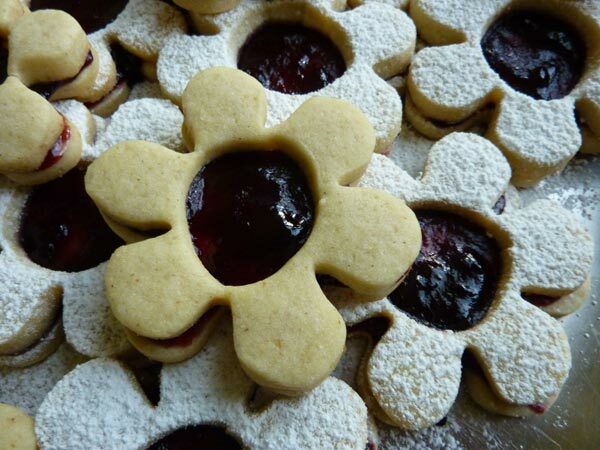 I just spread the jam on top of the whole cookies, then placed the cookie with the hole on top. At the very end, sprinkled powdered sugar on top. Meeta’s tip: If wrapped in tinfoil/cling wrap or kept in airtight containers in a cool place, un-decorated cookies can last up to a month. Mine didn’t last that long The spices weren’t very strong but gave traditional sugar cookies a little bit of a twist to the usual butter flavor.